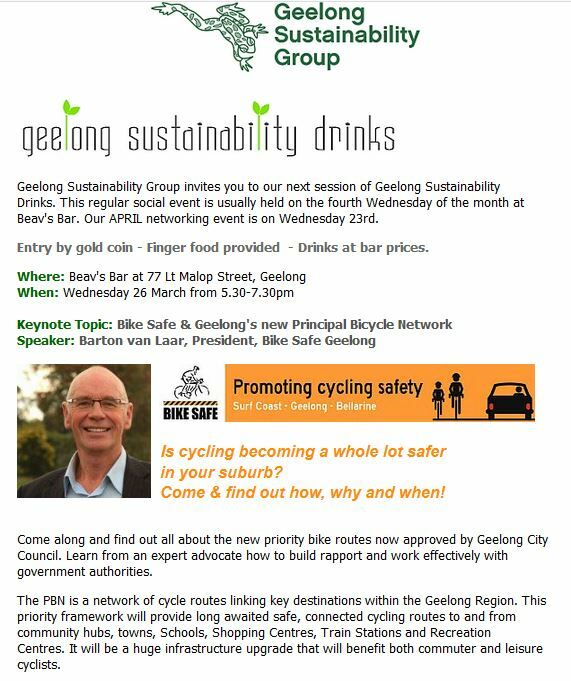 Rosemary suggests as many members as possible attend Geelong Sustainability Groups monthly gathering at Beav’s Bar next Wednesday evening. Barton van Laar, President of Bike Safe Geelong is the guest speaker. Please register for catering purposes. This entry was posted in Bicycle Advocacy, Bicycle commuting, Cycling Safety, Events, Sustainable transport and tagged Barton van Laar, Bike Safe Geelong by hlyth2013. Bookmark the permalink.